Bond was seriously embarrassed at not being the only one to go to the fancy dress party in a cheap knock-off Kill Bill outfit. I knew this day would come eventually. The day when I would have to confront my deepest, darkest fear. The day when the truth would finally be revealed to me, when innocence would be stripped away and when some of the most treasured memories of my childhood would be held to close scrutiny, and may never be the same again. Yes, BlogalongaBond has finally reached Moonraker, and it’s time to face the facts: Moonraker was the first James Bond film I ever saw, and when I was a kid, it was my favourite Bond film. 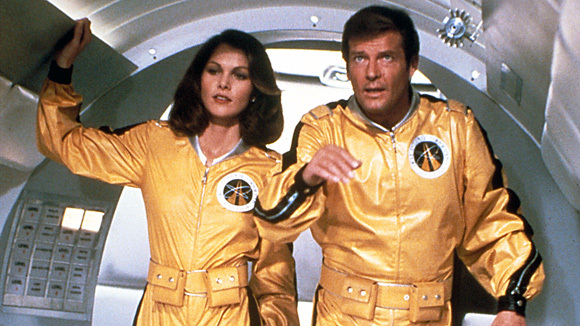 I could sit here and make excuses, but when you think about it, Moonraker is the ideal Bond film for kids. Much of this is down to the direction that Jaws has been taken in, his seeming indestructibility taking the series past the point of self-parody to a point where nothing feels dangerous or serious any more. But it’s also ideal for those, like children, with short attention spans; forget the three act structure, you attempt to stitch a start, middle and end out of the plot and you’ll barely cover half the film. What’s painfully clear is that the film I enjoyed as a child leaves rather more to be desired as an adult. Some of that is also down to Bond, and by that I mean the way he’s written as much as the way he’s performed. Roger Moore has the most famous arched eyebrow in movies, and here it’s in full effect. The script gives him plenty to react to, so Roger gets through a full range of expressions of surprise, from mild surprise to total astonishment with a side order of smug self-satisfaction to boot. But there’s also some issues around Bond’s competence; even if you have got a hang-glider in your boat, would you really drive headlong for a giant waterfall when you could just turn around and drive back the other way? And let’s not even talk about Bond’s repeated attempts to punch a man with giant metal dentures IN THE FACE. You might think this is awful, but it's the most succesful Bond movie ever. Mmm, residuals. There are some good moments (the opening sky dive – up to the point where Jaws attempts to open his parachute – and the cable car fight – up to the point where Jaws attempts to stop the cable car – are notable), but there are also some strange moments, not least when Bond rocks up at a cross between Logan’s Run and a Miss World pageant and gets strangled by a giant snake. Thankfully, it’s not a total write-off; as well as bearing the questionable legacy of being the Bond film that got me into Bond films, there are a few lasting legacies from the, erm, (counts on fingers) eleventh Bond film. The space shuttle hadn't yet had its operation, and was mounting everything in sight. Bond films have, especially more recently, wanted to be a reflection of modern technology and there’s no better example of the Bond movies being one step ahead of the real world than the use of the giant white space rockets. They’ve also given rise to the most unlikely trilogy in the world: The Space Shuttle Trilogy, consisting of Moonraker, Space Camp and Space Cowboys (all three of which would have been suitable titles for this film). Sadly the space shuttles are no more, and their thirty year legacy has come to an end, and if I ever do get into space it’ll be in something a lot less classy – but if easySpace exists in my lifetime, I’m not proud. Despite his incredible stature, Jaws was surprisingly good at the game of Statues. For the second time in the Seventies, a character made enough of an impact to be asked back again. (What’s this, Evangelist, I hear you cry? How can this be a legacy if it’s been done before?) I’ve already made reference to it, but Moonraker is the film that brought back a character, and in the process not only diminished the current film, but also unfairly tarnished the memory of the previous one as well. It’s now impossible to watch the Bond films in order without feeling a creeping sense of dread whenever Jaws is on screen in The Spy Who Loved Me at what’s to come. You would also be entirely within your rights to have developed an irrational hatred of pig tails while watching Moonraker, although maybe it’s not so irrational. And that’s it. Slim pickings, but there’s still some moderate Moore to come. Keep the faith, people. Next month: Bond drives a Citroen 2CV. Actually, forget the faith, abandon all hope, or just go and hide in a hole until Dalton gets here. It’s For Your Eyes Only. This entry was posted in Blogalongabond and tagged children, James Bond, Jaws, Roger Moore, space shuttle. I’m great with numbers, or names of films, but anything else and I’ve got a memory like a, erm, thingy, you know. I should’ve said car – that would have been a safe bet. Duly corrected, and thanks for the spot.